In 2017 the Shenandoah County Fair Association celebrated the 100th anniversary of its founding. As part of that celebration the Northern Virginia Daily newspaper partnered with the Fair Association to collect digital scans of historic material related to the fair and to utilize some of these scans to create the book "Shenandoah County Fair 1917-2017." Following the completion of this project the scans collected by the newspaper were donated to the Shenandoah County Library. 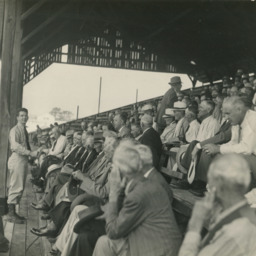 These became the basis of our Shenandoah County Fair Digital Collection and a special exhibit at the 2017 Shenandoah County Fair which featured 100 historic fair images. Capturing the history of a unique and complex event like the county fair is a daunting task. This exhibit that seeks to do that by highlight various aspects of this event. The animals, ribbons, food, entertainment, exhibits, and crowds are all here. These 100 images hopefully help capture the true identify of the Shenandoah County Fair. We invite you to explore and learn about the history of our fair and the communities it represents. Share your impression and experiences on the fence wall behind you. Then be sure to venture out and capture new memories at the fair.